Bluette became a part of my life in June of 2001. 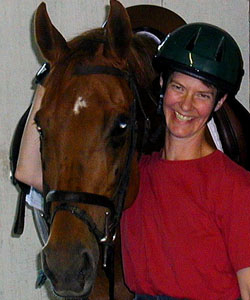 She was my first horse after injuries had left my wondering if I could ride again. She made it possible. 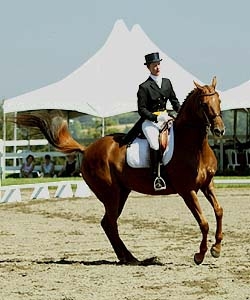 Bluette was a beautiful and proud chestnut Danish warmblood mare. 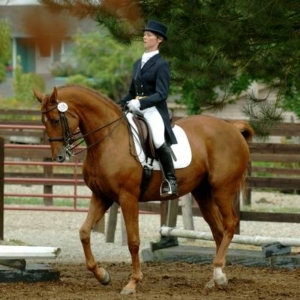 She had the skills and sensitivity I wanted and needed to advance my dressage education. I had no idea when I got her how profoundly she would influence my life. She arrived one sunny afternoon to my home at that time, in Redmond, WA. 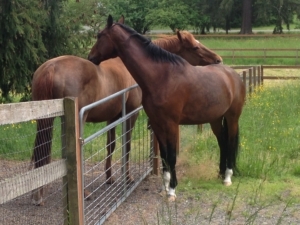 She immediately demonstrated her sensible self as she looked around the property, met Mac (the resident Appaloosa gelding), and then walked laps about her paddock, drinking water, eating hay, and replenishing herself after her long trip from Denmark (via quarantine at UC Davis). After the usual months long “getting to know each other” period, Bluette and I were off and running. She was strong, but so was I. She was opinionated, but so was I. We argued and then made up. We were the perfect match. I was determined to make the most of my time with her, and she was a willing partner. We’d struggle, and then there was brilliance – addictive brilliance – enough to keep me going out to ride, every day, rain or shine. 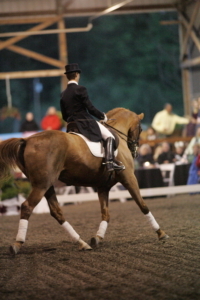 With Bluette the doors opened to riding I had never imagined. I rode with amazing clinicians from all over the world. Some saw great potential in our partnership, some only saw our challenges. Either way, I was a sponge, taking in the information and the experience. Some were hard and frustrating, no question about that, but I look back on them all as rich and wonderful. And what a luxury to have had them! Bluette’s personality and spirit blossomed. She was queen of my farm, and all neighboring properties. When I had chickens, she’d herd them about. When I had goats, she similarly made sure they were in the “right” place at all times – but she also had this enveloping maternal presence. 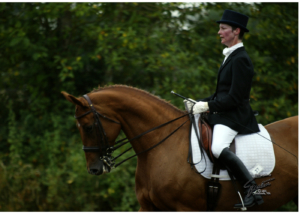 When a goat left the property, or returned, Bluette was nickering and whinnying to it, making sure it was OK.
Bluette and I tackled the advanced levels of dressage competition. 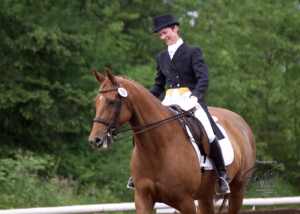 We rode Fourth level tests in 2002, and Prix St. Georges and Intermediare I in 2003 and 2004. 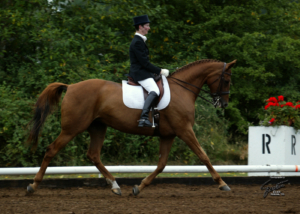 We pushed on and with regular and skilled assistance, Bluette and I schooled all the movements in the Grand Prix test. 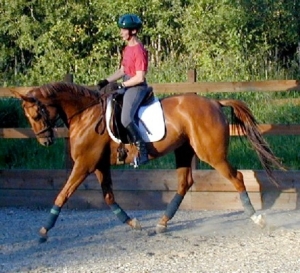 She was blessed with a lovely natural and easy piaffe and passage. I just needed to learn how to access them! Her flying changes were easy – for the two-time changes, but oh my goodness, the one-time changes were SO HARD for us!!! But we eventually got them. 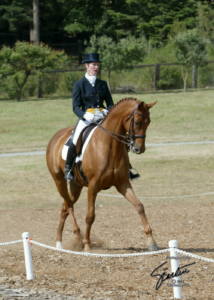 In the summer of 2005 we rode Intermediare II; then in 2006, Grand Prix. These rides were good enough for us to earn the USDF gold medal. And these rides turned out to be our last in competition. Shortly after, Bluette had a series of soft tissue injuries the led me to back off on her training. 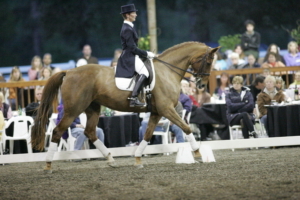 I am so grateful for the opportunity to try my hand at the Grand Prix test. I knew we would have problems, but if I had waited until all was “perfect” (Hah! That never happens!) I would not have had the experience. Thank you to all that supported me and encouraged me to forge ahead. It was perhaps a once-in-a-lifetime experience. I have so much respect, as a result, for those who compete at that level. It is so hard! For the next ten years of her life, Bluette was ridden lightly. She developed Cushing’s disease, which became progressively harder and harder to manage. 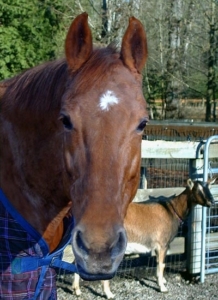 She retired to a farm on Vashon Island in the spring of 2016. In the end, her metabolic challenges won. Bluette was laid to rest on Saturday January 20, 2018. 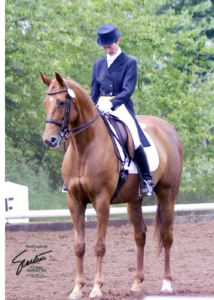 While I am grieving, there is a part of me that is filled with joy and gratitude for having this horse in my life. I am so grateful to have had the opportunity to experience the work, challenges, and rewards of our vigorous training together, and the deep bond and love that formed between us as a result. Bluette, you’ll live in my heart forever. Thank you for the ride.